UN Volunteer Monitoring and Evaluation Officer Marco Fayet (France) served with UNICEF in Lubumbashi, DRC. He visited Mufunga Sampwe village to introduce good hygiene practices to eradicate cholera. The Democratic Republic of the Congo is one of the most malnourished countries on earth, with over 4.6m children acutely malnourished, including 2.2m children suffering from severe acute malnutrition. The country is also facing an epidemic of sexual violence. Spiraling humanitarian needs and the rapid escalation in grave protection violations against women and children in the DRC should be of concern to everyone. UN Volunteers are part of UN entity and partner solutions to address challenges in the DRC and similar contexts. Whether international, national or youth, UN Volunteers provide basic social and medical health services, build communitiy resilience, and support humanitarian and peacebuilding efforts. Check out results delivered in sexual and gender-based violence, humanitarian assistance, peacebuilding, and health and nutrition, to name just a few. At the end of March 2018, some 400+ UN Volunteers were serving in the DRC. Meet Marco, Ayawavi and Catherine. Since January 2017, I have been stationed with UNICEF as a UN Youth Volunteer Monitoring and Evaluation Officer in the south of the DRC. My duty station oversees UNICEF activities across a vast region which includes provinces currently undergoing a dire humanitarian crisis. Last year the United Nations classified such territories as the highest humanitarian emergency level, acknowledging the complexity of the crisis and the scale of the needs that follow. UNICEF focuses both on emergency activities as well as development programmes focused on improving the well-being of children, women and families. The programmes are split between various sections: Communication for Development, Child Protection, Education, Emergency, Health/Nutrition and Water, Sanitation and Hygiene (WASH). As a Monitoring and Evaluation Officer my role is to help these sections and our implementing partners (government agencies and other NGOs) design programmes and interventions that will best address the needs of our beneficiaries on the ground. My tasks are fairly quantitative by nature. Within the office, I act as a bridge between the programmes and the management by designing tools and analysing data that provide information on how well we are doing compared to our original objectives. The indicators I compile will for example track the number of children vaccinated, the number of demobilized child soldiers, or the number of registered births disaggregated by territories. I also keep a close watch on donor grants and budget flows which underlie the implementation of activities. Occasionally, I collect data first-hand at field level and provide guidance and capacity building to our implementing partners. During one such mission, I accompanied UNICEF, NGO and government WASH experts who are working to eradicate cholera by building wells, latrines, and sharing good hygiene practices with families in remote villages. I also accompanied protection experts to a child tribunal, education specialists during school visits, and health specialists overseeing a polio vaccination campaign. Finally, I also participated in volunteer activities such as tree-planting and fundraising campaigns for children in hospitals. The variety of tasks that I have been assigned to do has helped me grow both professionally and personally. Observing the United Nations operations on the ground also gave me a valuable understanding of how important it is as an organization, as it can sometimes seem cryptic and inscrutable from the outside. To conclude I will say that serving as a UN Volunteer for the children of the DR Congo has been an immense source of pride and has strengthened my conviction to keep working in development and humanitarian aid. In a small, remote field office like Dungu, a Planning and Coordination Officer like myself has to wear many different hats. Since arriving in September 2017 as UN Volunteer, I have had the opportunity to learn how wide the mandate of United Nations Organization Stabilization Mission in the Democratic Republic of Congo (MONUSCO) truly is and how civilians, military and UN Police staff must work together in order to accomplish the goal of the mission. In Dungu, no two days are the same. Every day brings a new challenge – monitoring the implementation of Quick Impact Projects and community violence reduction interventions, providing input and preparing reports on operations and participating in meetings on the protection of civilians are just a few. Working directly under the Head of Office, I engage with a number of different stakeholders on the ground like UNHCR, the Armed Forces of the Democratic Republic of the Congo, General in command of the Operations Uele Sector and his team, Territorial Administration, and a wide range of civil society representatives, including international and national non-governmental organizations. I also regularly collaborate with partners like the UN Office of Central Africa and the African Union (AU), particularly in relation to the AU's Regional Task Force on Combatting the Lord's Resistance Army (a rebel group which has operations in the DRC). Knowing that the projects that I oversee and help to implement in and around Dungu will have a lasting effect on the local population is rewarding. It is also yet another way MONUSCO is bringing stabilization to an area that has been touched by armed conflict. Quick impact projects proposed by substantive sections, UN Police, or the Force in each field office and go through a rigorous approval procedure, making sure that the impact on the local community is measurable and beneficial. In Dungu, the Royal Moroccan Army is constructing a maternity ward in Dungu-Mayi, which is located in between Evaza and Dungu centre and is along the road between MONUSCO Dungu and its headquarters. Women had to walk over 15km into Dungu town to receive pre- and post-natal care prior to the construction of the maternity ward. By creating this new facility, the health of women and their children will be improved throughout the Dungu community. Another project, carried out by the Joint Human Rights Office in cooperation with Association de Maman Courageuse de Dungu, is the reconstruction of a primary school in Ngilinga, rebuilding three classrooms and installing six toilets. Each classroom will accommodate 50 students and the school has over 300 students total. The school was partially destroyed by the Lord's Resistance Army. 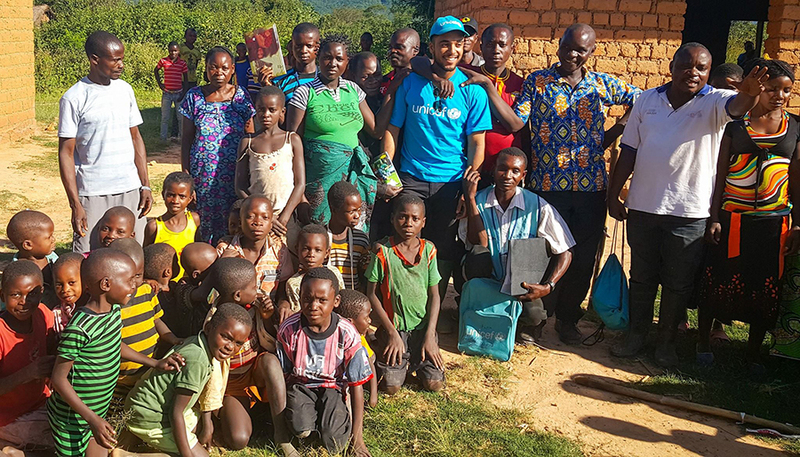 At the end of March 2018, some 400+ UN Volunteers were serving in the DRC with MONUSCO, the UN Refugee Agency (UNHCR), UN Development Programme (UNDP), UNICEF, Office for the Coordination of Humanitarian Affairs (OCHA), UN Women, World Food Programme(WFP), International Office for Migration (IOM) and the UN Joint Human Rights Office (UNJHRO).